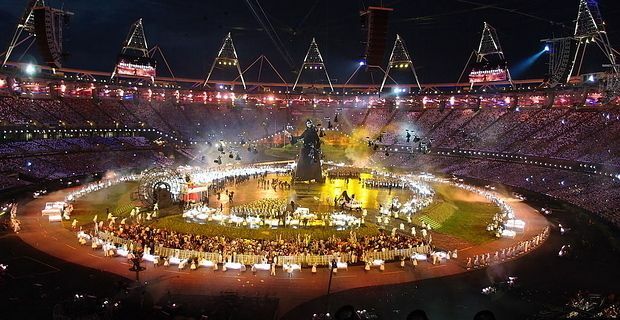 The London Olympics began with an opening ceremony by turns spectacular, irreverent, moving and comic. Director Danny Boyle crammed a millennium of British history into his three hour spectacle and gave worldwide viewers innumerable memorable images. Boyle’s narrative traced Britain’s development from a rural idyll through the chaos of the industrial revolution up to the digital present. Five golden Olympic rings were forged in the stadium and raised to the sky. Humour punctuated the proceedings. Rowan Atkinson reprised his globally famous role as Mr Bean, but the biggest gasps came when the Queen took part in a James Bond skit with actor Daniel Craig, in which the monarch supposedly parachuted into the Olympic stadium. An extended dance and fantasy sequence celebrated the work of the NHS and Great Ormond Street Hospital, interweaving their story with the theme of children’s literature. Later, spectral cyclists with angels’ wings circled the stadium to awed admiration from the crowd. The culmination of the ceremony was the raising of the Olympic flame cauldron, made up of hundreds of copper kettles representing every nation participating in the games. The flame was lit by seven young athletes representing the future of the Olympics That spectacular scene was the abiding image of the ceremony, even as it descended into bathos as Paul McCartney led an off-key singalong to Hey Jude. International reaction was admiring. Argentine daily La Capital wrote "London impressed the world with a fantastic Olympic opening." Le Parisien described "an opening ceremony that was magnificent, inventive and offbeat drawing heavily on the roots of British identity". L’Equipe said "we already love these Games".